The most frequently used commands have been highlighted. 1 Record a new dictation (see Recording Mode below). 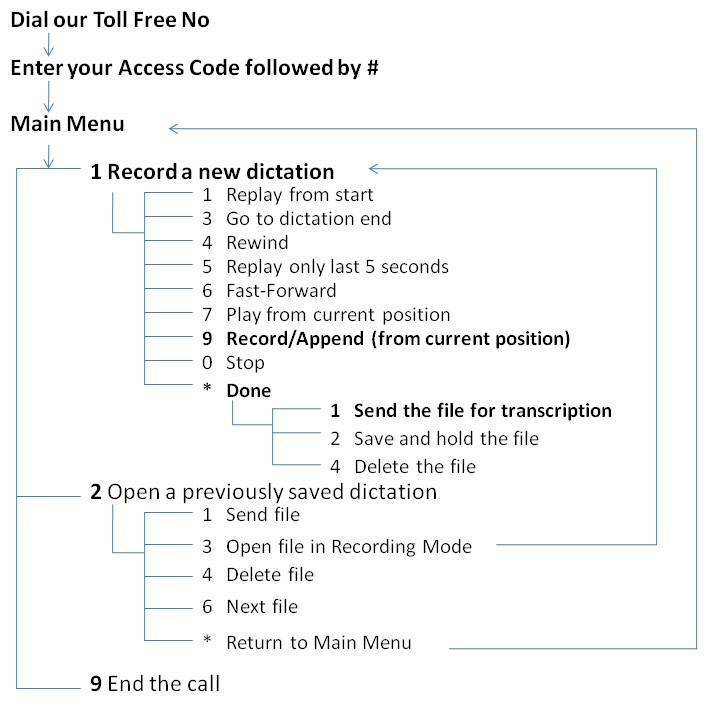 2 Open a previously saved dictation (see Opening Dictations below). After you press "1" on the main menu, you will hear the prompt "To start recording press 9...."
1 Go to the dictation start and begin play. 3 Go to the dictation end. 5 Review (step back 5 seconds and play). 7 Play from current position. 9 Record from current position. * Done (see Done Menu below). If you are not sure where you are in the recording, simply press 3 to go to the end of that recording. If you remain silent for 15 minutes, the system gives a warning "Stopped, Press '0', for more time. If you do not press '0' this call will disconnect in 20 seconds." So, if you are going to have a longer break, it would be best to save the file (Press * and then 2) and call again later to continue the saved recording. 1 Send the file for transcription. 2 Save the file for later / further recording. All of these options will return you to the Main Menu (refer above). 3 Open file. You will then be in Recording Mode at the recording end. * Return to Main Menu (above). Please always exit the system correctly (via the end ('9') command on the Main Menu). Otherwise you can lock the line out for other callers for 300 seconds. Once you get used to DRS, you need not wait for any menu prompt to finish and simply press your option to proceed further.